The Czech native is one of the youngest Richard Mille female sports partners and is in good company with names such as Nafissatou Thiam, World Heptathlon champion, and Ukrainian high jumper Yuliya Levchenko. On a recent trip to Courchevel, hosted by Richard Mille, who since the brand’s inception has been actively collaborating with partners at the pinnacle of their respective sporting disciplines, we were lucky enough to spend some time with this determined and multi-talented young lady. Read on to find out more. When / how did you realise you had talent that could take you to compete at the highest level? It wasn’t just one event, there were a lot of different situations that helped me progress and with each step I became closer to fulfilling my childhood dream. Well, you see here (points out to the slopes) this is my office, this is where I do business! I get up early to warm up, have breakfast, more training, recovery, physio, meetings with the coaches. And then a lot of travel. It sometimes feels that I spend more time travelling than I spend training. I really admire athletes (in all sporting disciplines) who are consistently performing at the highest level. I am just working hard to achieving consistency, to my best level, in both snowboarding and skiing. I also want to build a collection of my own ‘superhero’ costumes which my brother has designed*. Each year he will create a new design so I need to be good to ensure I have a wardrobe full of them!! *Ester’s brother is a well-known comic book illustrator and dabbles in fashion, and with a little input from Ester, has created racing outfits for Ester to compete in. He has transformed his little sister into something akin to a superhero…..and rightly so! Tricky, but If you had to choose one would it be ski’s or a board? I’m lucky that I don’t have to choose (she says with a giggle and a twinkle in her eye) but seriously now if I can’t do one I wouldn’t do the other. Image credit: FABRICE COFFRINI/AFP/Getty Images. If you weren’t a professional athlete what would you do? Music is a big part of my family – we’ve grown up with it (her father is a famous Czech composer and singer and her brother is a musician too) so I think it would be a path I would have taken, I’m currently teaching myself to play the guitar but I’d rather be on the slopes. Which is your psyche up song? Taking care of business by Bucheckern Turner. Tell us more about your partnership with Richard Mille? I joined the Richard Mille family early this year and right from the beginning I knew the partnership was a great fit. I’ve always been inspired by the athletes within the family so I was honoured to join and be part of such a great story and share the values the brand believes in. It’s not only the craftsmanship, innovation and performance of the actual timepieces but also the way in which Richard followed and achieved his own dream and the way in which the brand is more like a big family. When I met the Richard Mille team at the World Championship it was immediately clear that their focus is very people orientated, they take time to get to know you as an individual, they offer you great support and are happy to share both the highs and the lows of your journey. It is clear that family is important to Ester. Her grandfather is her coach and her mum, Zuzana, a former figure skater and the person Ester attributes her speed ability to, joined Ester on our trip and radiated just as much warmth and personality as Ester. The two clearly have a special connection and despite her dislike of flying Zuzana still travels the world to support her daughter. And when it comes to the timepiece which is your favourite? I’ve been wearing the RM 007 Titanium which combines beauty, ergonomics and technology and have also been testing a prototype of the RM 67-02 Automatic Extra Flat on the slopes and in competitions. Your career means you travel a lot – where is your favourite place for both work and leisure? I love all the places I travel to compete and train for different reasons but honestly when I’m not working I ‘d rather not travel. I love being at home with my family and friends. From my mum and grandfather – they taught me how to lose and how to deal with it and then create something from it to improve yourself. Do what you love and believe in – if you’re having fun life is complete! Enjoyed reading this? We think you’d also enjoy our Q&A with Alexis Pinturault. 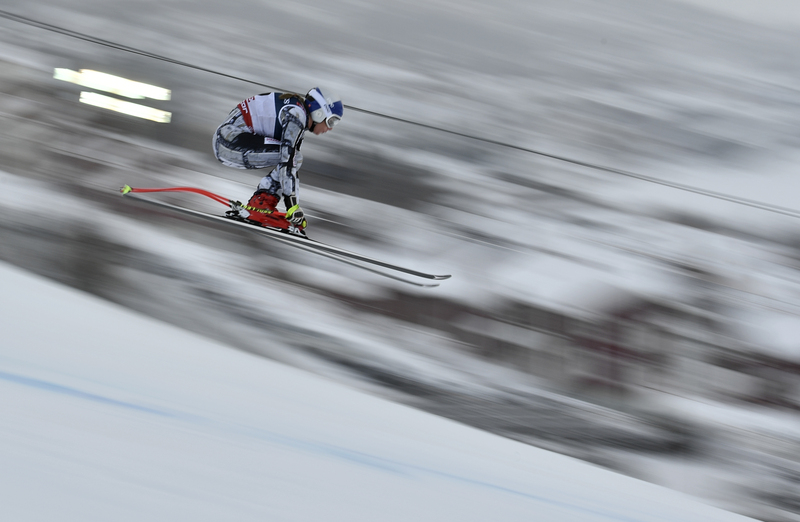 Discover more about the World Champion Alpine Ski racer here. View the full Richard Mille collection online or visit the Richard Mille Boutique at 90 Mount Street, London, W1K 2ST.